Can I Use Allergy Eye Drops If I Wear Contact Lenses? If you're one of the millions of Americans who suffer from seasonal allergies, you may be doubly miserable if you wear contacts. Allergens are attracted to the surface of contact lenses, making your eyes a veritable magnet for irritants like pollen and ragweed. The good news is that there are plenty of options for dealing with seasonal allergies including antihistamine pills or nasal sprays. Medicated eye drops can also provide much-needed relief so long as you use them as directed. Eye drops formulated for allergies are available over the counter (OTC) as well as by prescription. One of the most widely used OTC drops is ketotifen, sold under such brand names as Zaditor and Alaway. Prescription allergy eye drop options include Pataday (olopatadine) and Optivar (azelastine). Unlike regular eye drops, these contain an antihistamine that blocks a chemical released by the immune system called histamine. Histamine is the substance responsible for triggering allergy symptoms of the eyes, nose, and skin. 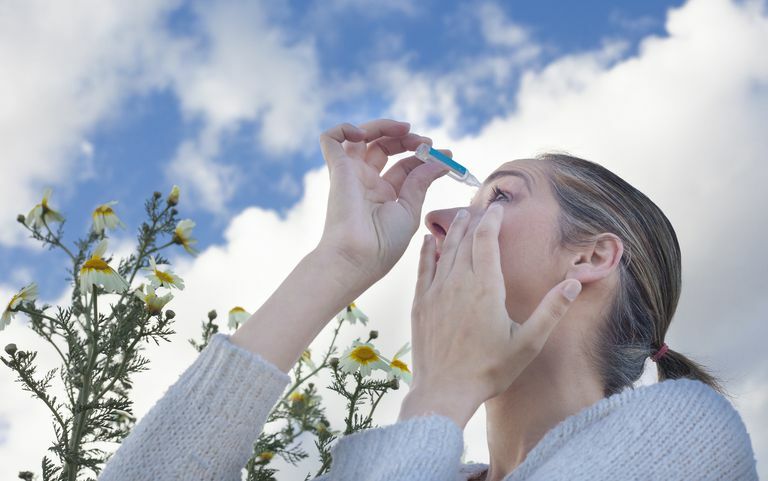 Antihistamine eye drops are generally safe to use with both hard and soft contact lenses. It is generally recommended that you apply the drops without your lenses and wait for at least 10 minutes before putting them in. This better enables an anti-bacterial agent known as benzalkonium to be absorbed by the lenses. Be sure follow the prescribing information on the packet insert. Do not overuse or keep drops past their expiration date. As a rule of thumb, once you have opened the eye drops, you should never keep them for longer than three months. For persons prone to seasonal allergies, many ophthalmologists will recommend single-use soft lenses over hard ones. By changing your lenses daily, you can minimize the debris buildup that can exacerbate allergy symptoms. For those who are unable to tolerate soft lenses, gas-permeable lenses are a good alternative. It is important, however, to always precondition them. Rewetting drops can also help as can alcohol-based surfactants which remove protein and debris from the lenses. Change your soft lenses more frequently. Just because the label says "daily" doesn't mean you can't change them more frequently. This may not be something you want to do so on an ongoing basis, but it can help if you have to be in public and would rather not do so with red, swollen eyes. Get artificial tears. Purchased over the counter, these can help wash away allergens and soothe the eyes. Be doubly sure to find a brand that is preservative-free. Wear your glasses instead. This is especially true if you suffer profound or persistent eyes symptoms. Don't rub your eyes. Rather, use a cool compress to help soothe and alleviate the itch. Shower before bedtime. Allergens can accumulate on your body and clothing during the day. Washing helps remove them and may help you sleep better at night. If you are suffering from red, swollen eyes, don't assume that allergy is the sole problem. You may have an eye infection or be experiencing a reaction to the topical medications. It is always best to have your eyes checked by a doctor if symptoms persist, worsen, or there is a visible discharge from the eyes. Urgacz, A.; Mrukwa, E.; and Gawlik, R. "Adverse events in allergy sufferers wearing contact lenses." Postepy Dermatol Alergol. 2015; 32(3):204-9. DOI: 10.5114/pdia.2015.48071. Wolffsohn, J. and Emberlin, J. "Role of contact lenses in relieving ocular allergy." Cont Lens Anterior Eye. 2011;3 4(4):169-72. DOI: 10.1016/j.clae.2011.03.004.